Welcome to Midnight, Texas, a town with many boarded-up windows and few full-time inhabitants, located at the crossing of Witch Light Road and Davy Road. It’s a pretty standard dried-up western town. There’s a pawnshop (where someone lives in the basement and runs the store during the night). There’s a diner (although those folk who are just passing through tend not to linger). And there’s new resident: Manfred Bernardo, who thinks he’s found the perfect place to work in private (and who has secrets of his own). Just before I started this blog back in 2010, I spent a couple of months binge reading the Southern Vampire series. I read all of the books that had been released at the time pretty much back to back and (although I actually haven’t read the last two books yet) reading new instalments was like comfort reading. So when I got offered the chance to be one of the first to read the first book in a brand new series, I just couldn’t resist. I’ve been reading pretty slowly since I’ve been busier at work but, just like the exploits of the residents of Bon Temps did a few years ago, the exploits of the residents of Midnight had me hooked. I read Midnight Crossroad in less than a week, which, compared to my pace before that, is blistering. I don’t know what it is about Harris’ writing but there is something about the way she tells a story that I find unbelievably easy to get tangled up in. This series is more subtle than the Southern Vampire series and, rather than marching right up to you and grabbing for your attention with raunch and gore, sort of sneaks up and before you know it, it’s past your bedtime and you’re still turning the pages. Or, in my case, you’re scrambling through the last pages sat in your car and desperately trying to finish it before you really do have to go to work! I haven’t read any of Charlaine Harris’ other series (although this has reminded me that I probably should…) so a lot of the cameo appearances from characters from those series passed me by a little bit. Much though I’m kind of sad that I didn’t get to play the character spotting game and might have spoiled a couple of other books for myself but mostly I’m pleased that I got to read about these characters in Midnight. The town has a nice, kind of warm feel to it, even while everybody is making such a big deal about keeping themselves to themselves. They’re what keep the story going and really what made it one that I wanted to keep coming back to. When I think about it, it was the characters that kept me reading the Southern Vampire series long after I was really interested in what was happening to them so maybe that’s where the magic happens in Harris’ series. Go into this if you want something with a whiff of magic and paranormal, sarcastic talking animals, political gangs and fledgling witches but not so much if you want an innovative plot or mind-bending mystery. One minor criticism that may well just be because I’m British but there was something about the names that I found a bit off-putting at first. I don’t care how many descriptions of someone’s athletic physique, bronzed skin and pearly white smile you include, if you call a character Bobo, there is no way I am going to be able to think of him seriously as an object of desire. It just wasn’t working for me, even among the funkier range of names in Midnight…it’s tiny now that I’ve written it out but it bugged me while I was reading it so there we are. So I liked Midnight Crossroad well enough. It’s fun, there are plenty of secrets and a few twists but there’s still something lacking on the mystery side. I preferred the sides of the story that were about the residents and their hesitant relationships but there was something a bit lacklustre on the whodunnit side. I say that but I didn’t see the ending coming and I really did have to know the ending by the time I got to it so maybe I should give it more credit. Either way, the characters are pretty great and the whiff of the supernatural was a nice change from some of the more in your face series. I didn’t care about the murder and I wasn’t really bothered who’d committed it (and wasn’t really that sold on the big reveal after I knew the ‘who’ part) but the getting there was enjoyable enough. Overall: If you were a fan of the Southern Vampire series or any of Harris’ other series (I’m guessing there…), I probably don’t need to tell you to pick up her latest. It was good to get to enjoy Harris’ writing again without the angst of the later outings of Sookie Stackhouse and the series is one I’d try again, mainly because I’m intrigued to see if it keeps on the mystery path or heads more in the paranormal direction. Source: Received from the publisher in exchange for an honest review – thanks, Gollancz! 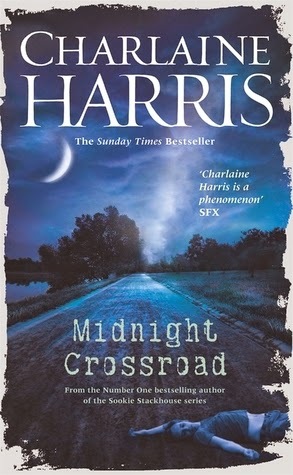 Midnight Crossroad was published in hardback and eBook format on May 6th! Fancy a cheeky peek at the first four chapters? Head HERE! Bout of Books 11: I'm in!